For years, Olga has lived in the kiosk where she sells magazines and cigarettes to tourists and passersby. She’s stuck in the job, literally she can’t get out — with her endless supply of candy bars and snacks, she’s grown too plump for the exit. 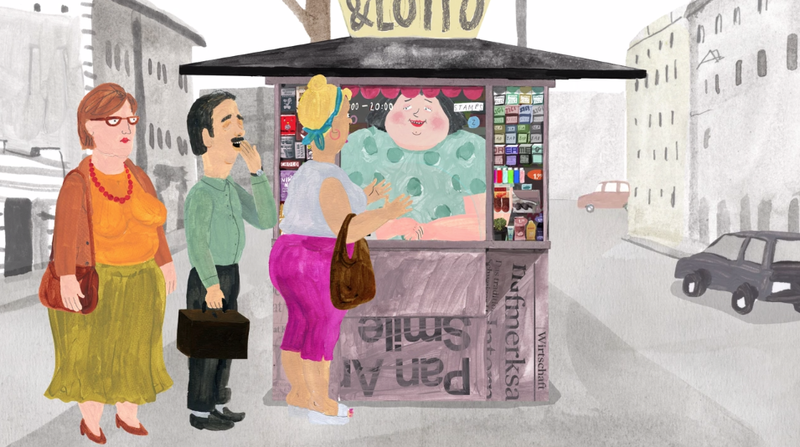 A delightful animated short by Anete Melece, "The Kiosk" registers its rich simplicity with child-like imagination. Olga daydreams of one day traveling to a far off destination, a serene beach somewhere she can watch dolphins jump and the sun set. She longingly flips through magazines, cutting out any beach scene she finds to plaster across her kiosk walls. And then one day, an incident with some local kids inadvertently leads to a breakthrough that just may free Olga from her confines. Melece is a Latvian illustrator and animation filmmaker based in Zürich, Switzerland. Her film is beautifully drawn and filled with charming details. Dialogue is presented as a gibberish mix, not quite decipherable but perfectly understood through inflection and context, an amusing effect. We haven't featured much animation in the past on NoBudge but we hope this begins a trend. Would be a great start. (7 minutes).